Tool steels continue to evolve due to the demands required by the manufacturing industries. 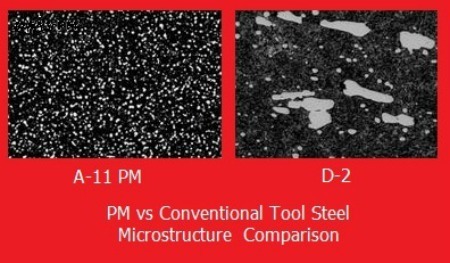 For many years, D-2 has been the dominate tool steel grade for high-wear applications. A-11 PM has emerged in the past 30 years to absorb some of the same requirements. Let's take a look at the two grades and see how they are applied in manufacturing. D-2 is a high-carbon high-chromium wear resistant tool steel that is used by many manufacturing industries. D-2 claimed the top seat in the 1970’s due to its’ wear resistance compared to many other grades that were available at the time. Grades such as D-3 and D-7 fell out of favor, and D-2 found itself in the top seat.